Cats, by nature, are pretty curious animals. It’s this curiosity that can keep them occupied and get them in all sorts of trouble at the same time. 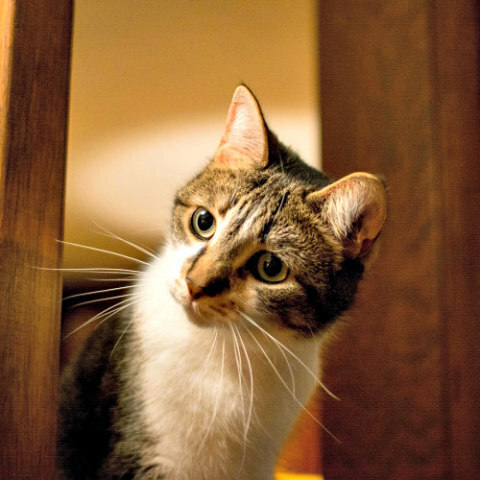 Because of their independence and freewheeling ways, pet owners seldom have to worry about them getting bored or depressed — unless the cat happens to be a house cat bound for eternity to stay indoors. While there are some pros to limiting your cat’s access to the great outdoors, one of the cons is tedium and dejection. With that in mind, here’s five ways you can help your house cat beat the mind-numbing blues. A healthy animal is not just physically fit. Happiness stems from environment and stimulation in addition to your body functioning properly and feeling good. Give your cat some added stimulation by giving them a window seat or perch of their own where they can sit and watch the happenings and goings on outside. If you live someplace where the windows don’t have windowsills or a narrow ledge, you can still attach them to the wall with anchor bolts or move a piece of furniture beneath the window for them to sit on. Your cat will thank you for it. 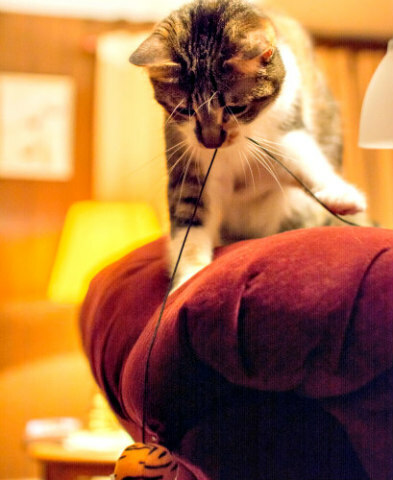 If you’ve got an indoor cat, you’ve probably already given them a whole slew of toys to combat boredom. One trick is to mix it up a little bit by rotating their use. Every once in a while take a few of them out of play and replace them with toys you’ve got waiting in the wings, so to speak. This can help make everything old new again. Additionally, try treat-dispensing toys, toys on elastic strings like a bat-a-bird, toys filled with catnip, toys with dangling feathers or strings, plastic fur-covered mice filled with noise-making beads, or what are called interactive toys such as toys that are basically puzzles with moving parts. Cat trees and ladders, kitty condos and other cat furniture give cats an opportunity to stretch, climb, hide, leap and pounce. You can indulge these instincts by purchasing one of these products in pet stores, online or make one yourself. The nice part about a DIY cat playhouse is they can be constructed of relatively inexpensive materials or up-cycled goods such as plastic or wooden crates, old storage tubs, large cardboard containers discarded from ice cream shops or any number of things and then wrapped in carpet remnants, throw rugs or sisal. Build or place them up high so they can peer down as if they were in a real tree. Sometimes an animal’s favorite toy is not the most expensive or fanciest item you can provide them with. Give them an old paper shopping bag, a shoebox or any kind of leftover boxes or bags from mailing and chances are they’ll play with it, in it, or on it until it’s destroyed. You can usually get a few days of playtime out of discarded packaging like this. Another thing cats love to play with are the plastic rings that secure the caps to gallon milk or water jugs. The next time you open a bottle of either beverage, peel the leftover flap of plastic off, throw it down in front of your cat and watch them bat it around for hours. Speaking of playtime, if you’re going to keep you cat indoors, then it’s up to you to give them some one-on-one attention beyond pets, rubs and kisses. That’s right, you should actually try playing with your cat or interesting them in one of their toys. The wands or sticks with dangling strings or feathers are a great way to entice your cat into playing. Some cats can even be engaged in chasing games. The point is to keep them active and interested in life. 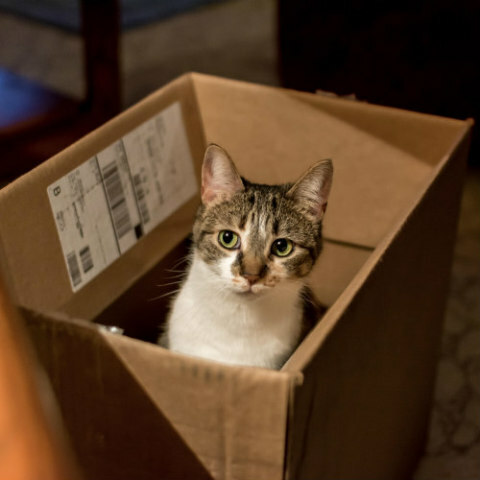 Following these five tips might just give your housebound feline the mental and physical boost he or she has been looking for in life.